TBH, it was actually 73 hours. Just that it takes about three hours to get from the plane to town, then about two hours from town to the airport plus two more hours of “get there early” time (necessary at ICN). Anyway, about 2.5 days of functional time there, plus sleeping. Seoul! Was flying from SLC, connecting in SEA onto Korean. Had a two-hour layover in SEA scheduled. Plane loads normally in SLC. Then the pilot comes on and says that due to Seattle weather, we’re going to be delayed an hour. I figure: this should still work out. I call up Korean Air and let them know what’s going on. They transfer me three times to different people and I’m on hold. There are options still to fly via LAX or LAS and be only six hours delayed. While on hold, the pilot comes back on and says he’s convinced ATC that his plane can deal with weather, so we’re going to depart, merely an hour late. I hang up the phone. Pilot drives the plane onto the runway. Then parks the plane, comes onto the PA and announces: well, we’re going to be sitting here for another hour after all. Flight gets to SEA two hours late. 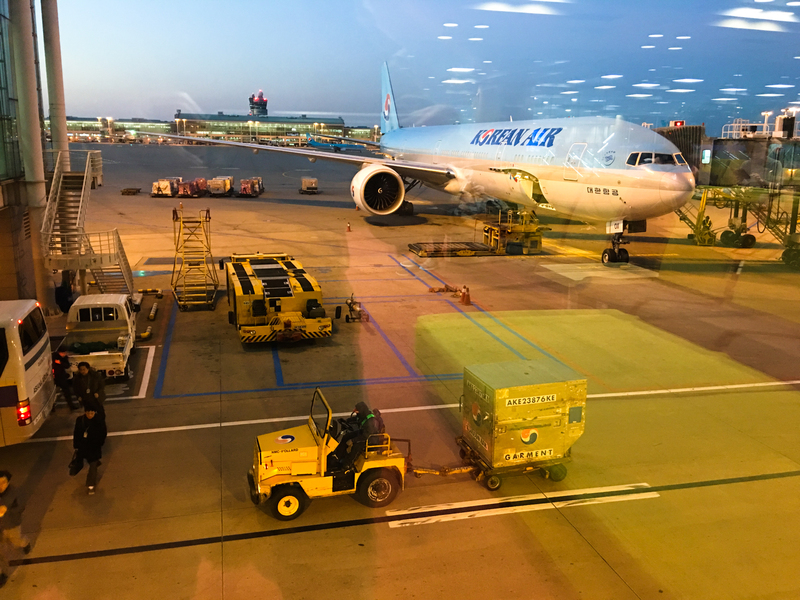 I run to the Korean Air gate. The plane is there still, but they don’t care and won’t let me on. Delayed 24 hours as a result after I turned down Delta’s eventual offer to re-route me thru Atlanta via a red-eye that would have resulted in only a 23.5-hour delay. And then I have to stand in line for an hour to get Delta to talk to me about re-booking, then it takes 45 minutes of the Delta rep being on the phone with another Delta rep to get me re-booked. Then I go to baggage claim to get my bags since I’m going to be overnighting and, just two hours after that, my bags appear. At any rate, despite SLC being my “home airport”, I’m accumulating all my miles on Alaska these days. We’ll give them the next couple opportunities to be awful, meanwhile Delta can go back on the pile with United and American. Korean Air was pretty great once on-board, though. 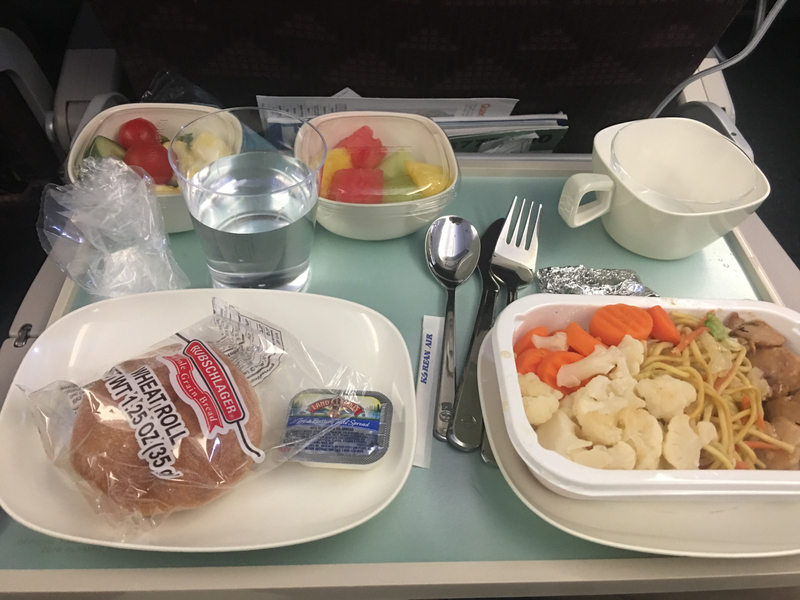 Their economy-class seats have the same amount of room as every other airline’s economy-plus seats, the food was pretty good, and since Americans believe North Korea’s about to attack something, the flight wasn’t full and I had empty seats next to me both directions. ^^ Dinner on KAL, the American option. My hotel room came with a bidet. Most of the buttons seemed to do the same thing. 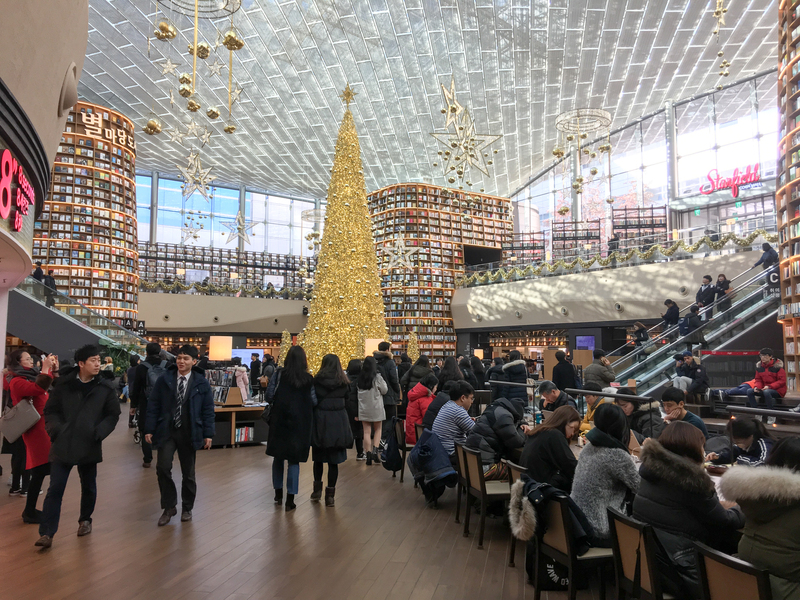 My friend recommended for me to book a hotel near Seoul Station so if you’re visiting, you should probably do that too. 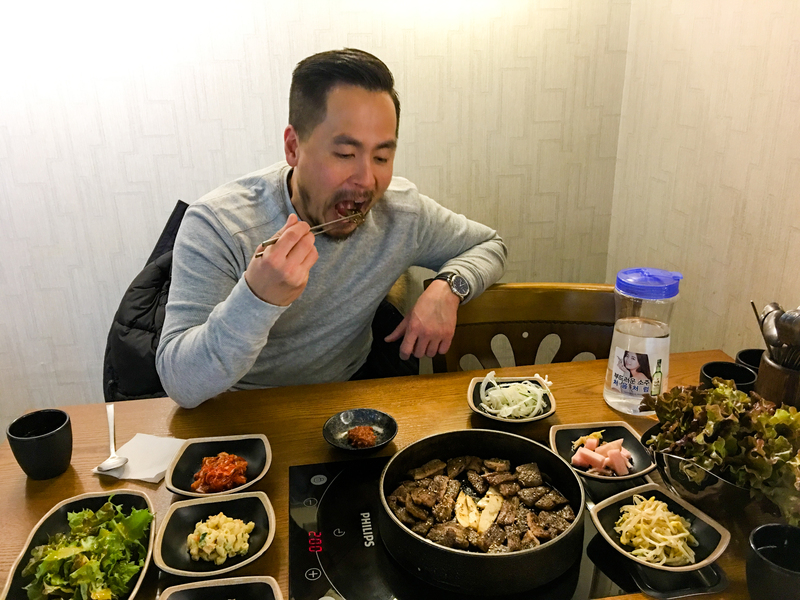 One of the better parts of the trip was having my good friend Inchan show me around some places and give me a “real Korean (tourist) experience”. For instance, here’s the palace that we didn’t get to until it was closed. 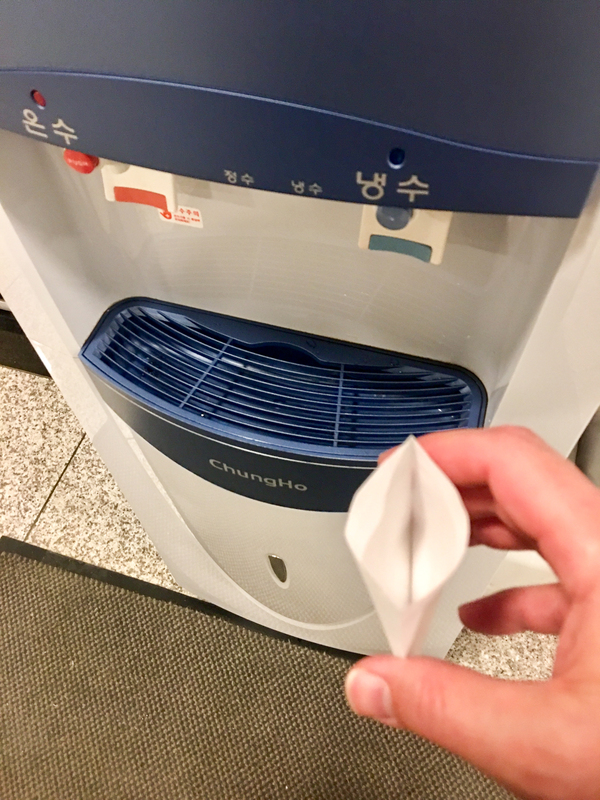 Then this is me getting an envelope of water at the Korean empire museum. Inchan also made it a mission of his to show me where to eat. We didn’t eat dog. I was worried I might acquire a taste for it, which might really sour things for me back home with the corgi. Anyway. This was a back-alley barbecue place that was pretty fantastic. 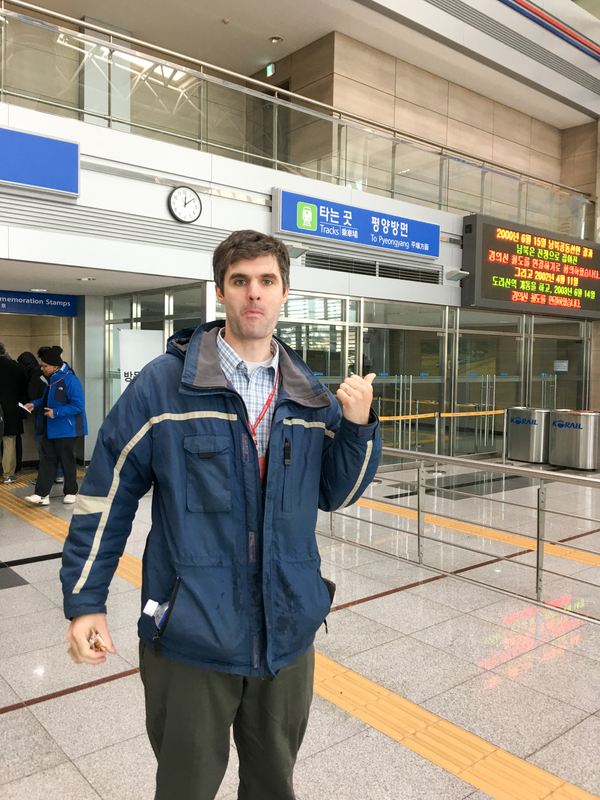 My buddy, Dave Eargle, whom I cunningly tricked into attending the PhD program at Pitt, and I went to the DMZ for about half a day. He worries that I don’t show pictures of other people on my blog, so: here you go, Dave! This is him waiting on the train to Pyongyang (which never did come 🙁 ). Finally, this is what my airplane looked like before I got on it. After? No idea. A lot of Korean people there. Everything in Seoul is a one-hour bus ride away. Except some things are a two-hour bus ride. When I went out to the palace with Inchan, I was the only non-Korean on the subway. Compared to my memories of Japan and Hong Kong, (South) Korea seems much, much more western. Where by “western”, I mean American. It just didn’t seem that foreign, which made it an oddly easy place to be visiting. Also, the hotel was surprisingly cheap — nice place, across the street from the conference center for $100/night. There is nowhere — nowhere — to buy snack-type food in the Seoul airport. This was a terrible realization when it happened. My favorite thing Koreans do is make an “ohhh” sound and nod their heads whenever someone tells them something stupid. The guy on the flight home was telling the flight attendant “I’m supposed to be at the front of the plane”, to which the flight attendant responded “ohhh” while nodding. It’s apparently the Korean version of the “bless your heart” put-down. And when I got home, I still had the bronchitis I’d left with. But no jet lag either direction. Weird.